Did you know that we feature a family friendly movie each night in our spacious courtyard when the Fallsview Indoor Waterpark is open? 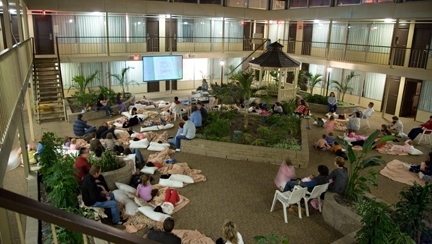 It’s always a lot of fun as kids (and adults) bring pillows, blankets, camp chairs and snacks into the courtyard and snuggle down to watch our staff’s favourite children’s movies including Shrek III, Bee Movie, The Incredibles and Horton hears a Who – to name a few. Movies change frequently so it’s best to check with front desk when you arrive for the schedule.